Pneumatic valve actuators are mostly used in industrial applications such as in chemical plants, construction ventures, oil refineries, underwater marine mining, and water management. They are usually made up of materials like aluminium, plastic, and stainless steel. Those that were made of steel are common in industries where complex pipe and product delivery conduits are used to manage corrosive liquids. With regards to turtorq actuators, they are widely utilised in engineering and industrial applications. This is because the said industries require precise movements, especially with gearboxes and positioning components. They make use of computer-controlled systems in regulating the amount of compressed air required to maintain precision movement. Such systems are managed from remote locations where corrosive chemicals and liquids are being directed or transported. In chemical manufacturing plants, where products are dangerous and hazardous, manual butterfly valves are installed in the same pipe segment individually or integrated into pneumatic valves actuators to address safety and security precautions. Flow sensors that are installed within valve actuators connecting to a central management system further promote safety. The said systems monitor and manage fluid flow within the pipe networks individually and groups. They offer a multitude of commercial benefits that outrank the use of hydraulic actuators. One is their ability to store energy dedicated to emergency uses whenever there is an electric interruption. Another is their ability to operate during massive energy charges, but the energy is not absorbed in the compressed gas system. These features make pneumatic valve actuators the best choice when dealing with industrial systems. However, these actuators do not function well in sub-zero situations. Fortunately, there are complex versions that exist, delivering compression through heated air systems that easily operate in extremely cold climates. The fluid delivery networks that are situated in these type of environment oftentimes have back-up or redundant systems to prevent production downtime that could greatly impact the production delivery and schedules. Emergency and fail-safe systems are required in demolition projects, underwater mining operations, and other complex liquid and fluid direction systems. Such systems help regain control or override management systems if failures or other serious malfunctions occur. They can be managed through mobile controls that can be deployed in minutes. Precise direction and flow of chemicals, corrosive liquids, and dangerous fluids need robust hardware that is capable of functioning under high payloads, while maintaining flow direction and precision movement within intricate pipe networks. 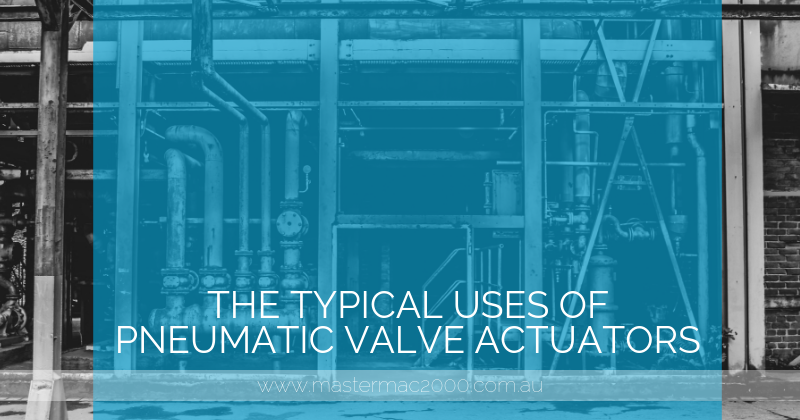 These systems rely on the power of pneumatic valves actuators. If you want to learn more about this topic, contact Mastermac2000.com.au today!